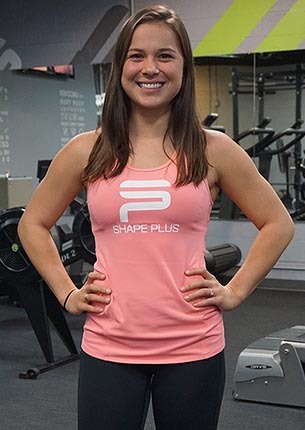 Meet our Denver Personal Trainers "Jess and the Shape Plus personal trainers in Denver are phenomenal." - Jeremy W.
Our Denver personal trainers have the highest in certifications, and have up to 15 years of training experience at Shape Plus in Denver. We are masters, innovators, and trailblazers setting the standard for personal training and amazing results so you can count on getting the best personal trainer Denver has to offer. Most trainers at Shape Plus are now partners! Our job and our passion is helping people achieve their goals and doing something amazing with every client we train. We want to do something amazing with you! 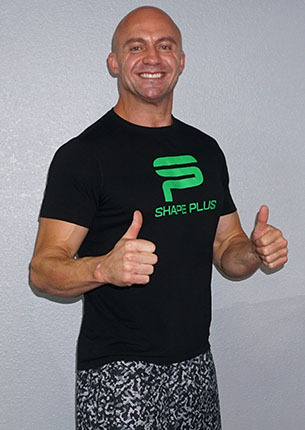 Jess started Shape Plus Personal Training business in 2003, and his gym has been at its Yuma Court location in Denver for the past 11 years. The whole philosophy behind his vision for Shape Plus has been simple: Focus on HELPING people. No matter what the goal of the client is, you can pretty much guarantee Jess will get them there. He still answers most all calls to Shape Plus and meets personally with almost every new client to make sure they get the right trainer for them. Jess has been fanatically fit for nearly thirty years, and has never allowed a Krispy Krème Doughnut anywhere near his body. His undying passion & focus ALWAYS finishes first. In regards to working out, if you feel most alive when you feel like you’re about to die, then Jess should definitely be your trainer. His clients always dig his workouts, and you can even catch them grinning when he does his “My-Client’s-In-Pain” dance. I always say that Jess could find a way to make the DMV fun, and his workouts are no different. Those who train with him absolutely LOVE every torture-fest, and they always come back for more. Just bring your “A” game, because without a doubt, he will futilely try to kill you and you will become stronger than you ever imagined. I am not joking. He is always sure that there is still 45 minutes left in your workout session. You can often hear him saying “show me your pain face”. One of his main objectives for every client is to be able to do a pull up on their own. He is responsible for 20+ first pull ups, literally thousands of pounds of weight loss, amazing transformation after transformation, and gotten to share so many amazing “first times”. He considers himself honored to be a part of so many peoples lives. Jess is married to Shawna, also a trainer at Shape Plus. They have two young children so he understands the struggle to stay fit, eat right, balance a heavy workload and still maintain quality family time. Shawna is an ACE Personal Trainer and Schwinn Cycling Instructor, as well as a Certified Youth Fitness Specialist. She has trained exclusively at Shape Plus for 10 years now, and helping her clients to lead a HEALTHY lifestyle is a great passion of hers. She firmly believes that if you focus on consistent training while eating wholesome & nutritious foods that make you feel great, then aesthetics will undoubtedly follow. Shawna always does her very best to avert workout boredom by developing unique strength & sports conditioning programs for clients of all fitness levels. Shawna has the ability to put fitness new comers at ease, and make them feel comfortable and confident in no time at all. Her focus as a Personal Trainer is to help and inspire her clients to find the type of fitness that they ENJOY doing on a regular basis, which ultimately helps them achieve not only consistency, but also maintenance once they reach their ultimate goal. She wants every person whom she trains to have the knowledge & proper tools for continuing on their fitness journey, and often reminds them that “Exercise is like brushing your teeth…you shouldn’t ever skip it, right?? ” . With that in mind, the least-pleasurable thing that most of her clients hope to forgo is Burpees. Her slightly masochistic but intriguing variations of this exercise will make you question your sanity for sticking around until you catch a glimpse of yourself in the mirror, and realize that your hard work is definitely paying off. All jokes aside, she says that there is nothing more rewarding than helping people overcome obstacles & make themselves stronger (inside and out). With so much in her arsenal, Shawna is huge asset to Shape Plus. Her strength training and conditioning experience has also helped the best to become EVEN better, such as the 2016 IBJJF NOGI Worlds Double Gold Champion, Nicole Evangelista! When it come to her own workouts, Shawna lives what she preaches, and enjoys everything from Running to Powerlifting and Yoga. She considers the numerous benefits of cross-training to be invaluable to every exceptional athlete. 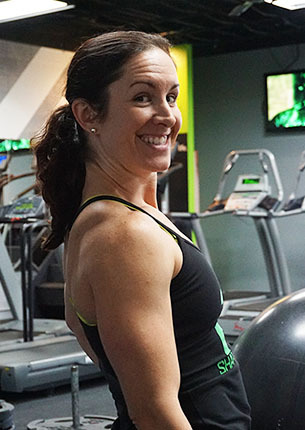 Shawna has been seen doing 20 consecutive Pull-Ups (at the end of an Obstacle Race), weighted pistol squats on the Bosu Ball, and deadlifting nearly 3xs her bodyweight. She knows how to work through setbacks and set the mind frame of how to come back even stronger! Only 20 months after ACL reconstruction, Shawna set a USPA Colorado State Record in the Master’s Division for Bench Press and Deadlift. Her preferred fuel for those types of lifts includes turkey tacos and copious amounts of peanut butter. Like many mothers, she navigates the challenge of balancing work and fitness while creating valuable family time. Married to Jess with their two young children, she loves hiking, cooking, and family vacations…preferably to any warm & tropical place where she can sit by the ocean with her Kindle. 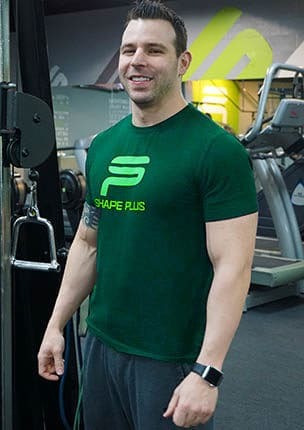 Ryan has been a trainer at Shape Plus the longest and has been certifiably the “Nice-Mean” trainer for 13 years strong and he has been a gym rat for over 16 years. Everyone always comments on how quiet & nice he is until they actually have to do his workouts. Don’t think you will ever get away with doing only 3 sets of ANY exercise. Ryan reminds everyone that “Arnold Says” you must do a minimum of four sets to adequately fatigue a muscle. That’s because Ryan has read Arnold’s Encyclopedia of Modern Bodybuilding in its entirety approximately seven times (by now, possibly eight). One primary reason why Ryan is often asked for his professional advice is because he is extremely knowledgeable on nearly all things work out related, and I wholeheartedly respect and value his opinion. Whether it’s questions regarding your post-workout supplement stack, superior grip for bicep curls, or the best HIIT workout for optimal fat burning, you should definitely ask Ryan. His exceptional knowledge of bodybuilding, body shaping, toning, sculpting, nutrition and sports performance has delivered amazing results for his clients. The main objective Ryan addresses is to “stay on track and overcoming obstacles”. He keeps every one of his clients on track with our food journal, and he goes as far as having his clients send text pictures of their cardio if it is part of their MMAP®. If accountability is what you need then you have found the right trainer. He draws inspiration from the likes of Kai Greene, Eric Thomas and the Rock. Let’s also say he has a great appreciation for Chic-fil-a sandwiches. 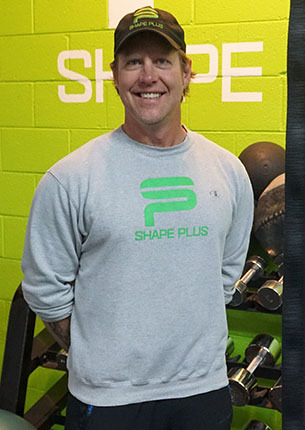 Greg has been a trainer at Shape Plus for 10 years and he has a number of clients who have been working out with him for exactly that long. His approach to ensuring his clients training and programs are always on point includes making sure they are enjoying their workouts. This comes from his own enthusiasm and pure love for fitness which is addictive. Abs and core work are always first with him. His philosophy on that is to get them out of the way so that you do not have to do them at the end of your workout (or end up skipping them all together!). If you work out with Greg on a Friday, chances are you’ll be doing some Clean & Press (Heck yeah!). That surely is one killer way to start your weekend! You can expect a wide variety of exercises and workouts when training with him. He likes to mix it up utilizing everything from free weights to medicine balls, rings, exercise bands, sleds, kettle bells, Bosu balls and so much more are in his toolbox. You will never get bored with your workouts! We are beyond stoked to introduce Jenna as a member of the Shape Plus Army. Jenna aka “JAM” was born and raised in Ohio, then later attended Miami University where she earned a Bachelor of Science in Kinesiology & Health in 2015. She has always been extremely passionate about sports, and grew up playing soccer, basketball and softball. In 2014, Jenna completed her first & only half-marathon (that makes her HALF Crazy!). She also competed in her first NPC Figure Show in September of 2016. Jenna’s hobbies include any and all sports at the park…especially some volleyball! She absolutely LOVES Leg Day, and Jenna says that dead-lifts are her Jam! Jenna’s fitness level & physique are the result of perseverance and consistency, which she believes are key to achieving any goal. Just as you will always see her smiling, Jenna likes to ensure that her clients also smile and laugh while they are working hard during their training sessions. Jenna believes that Strong is the new Skinny, and she is undeniably a force to be reckoned with in & outside of the gym. Alex hails from Florida and she attended the University of North Carolina at Chapel Hill studying Exercise & Sports Science before deciding that Colorado was the place for her. Her approach to helping people achieve their fitness dreams is to help them discover their own personally- tailored passion for exercise. She is a firm believer in encouraging people to push their physical & mental limits and yet to ENJOY the process of challenging themselves. Alex was an elite-level gymnast, and in 2013, she competed in the U.S. National Championships. So she knows what it takes to pursue and execute high level goals. For those that desire she can incorporate the best strength and flexibility of gymnastics into her workouts (look out, she’s a BOSS at handstand push-ups!!). From having untold numerous coaching experiences in her own past she understands the difference between being tortured and coddled and strikes the right balance as to support, respect and still push people to their potential. She has made it her mission to find the types of exercise that give a client confidence and feel like a rock star! With that being said… strength gains, weight loss, and conditioning are serious business to Alex. So don’t even try to chat up and distract her clients during their workout — she takes “the best hour of their day” VERY seriously, and that’s why her male and female clients absolutely dig her. Her hobbies include trying a new hike every weekend with her dog Scooby and trying out new ab workouts on her fiancée! Alex is real, personable, down to earth and fun. She will definitely make your workout “the best hour of your day”! Adam was born and bred in Broomfield Colorado and later graduated from Colorado State University. others and help others fall in love with fitness is unparalleled. Adam says “there is not one type of workout that is the best. The best type of exercise is the one that you enjoy and will continue to do.” That will change over time as you achieve goals, demands of life, and your body dictates change is necessary to develop. From constantly experimenting on his own body and coaching people with many different types of workouts including bodybuilding, large group circuits, HIIT, endurance events, gymnastics movements (aka calisthenics), and even taking 1st place in a power-lifting competition. To say he has a vast range of training for his clients to explore and find their love for fitness is an understatement. His philosophy to training is to give you what you need and then kick your gluteus maximus with fun and challenging exercises. Whether your workout is at 5am or 12pm you can plan on receiving an infusion of energy from Adam. He is always on! That may explain why he will have cereal for breakfast, lunch and dinner. Especially Honey Bunches of Oats! Adam is a very outgoing person and loves to meet new people so feel free to drop in sometime. I’m willing to bet he is one of the first people to say HI. Cassandra trains at our south location in DTC. Originally from Pharr Texas, she has spent the last six years in San Antonio earning her bachelors degree in Cellular Biology while running the B-ball court like a BOSS! Cassandra played basketball for the Schreiner University Lady Mountaineers for 4 years, and she earned multiple performance awards every season. Each year while on their team, she qualified for conference tournaments while also making a championship appearance. Cassandra’s competitive edge earned her a spot on San Antonio’s Semi-Pro Basketball Team, and she quickly found that In order to play strong, you Must stay strong! Cassandra found weight training to be an integral part which helps every athlete to Step Up their game! She also knows the importance of integrating mobility work, which greatly influences her training. Flexibility is also like a muscle, and if you don’t use it you will inevitably lose it. She does her very best with each and every client to get them moving in all the RIGHT ways to help them perform at their highest level. From form and posture to athletic performance and aesthetics, Cassandra will have your back (and front, and all other sides in-between!). 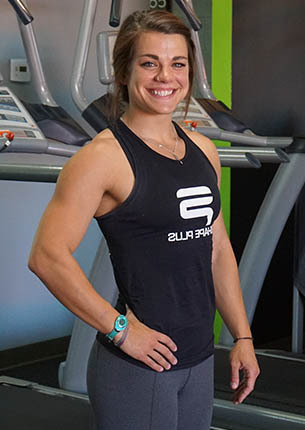 In addition to weight & sport-specific training, Cassandra has also interned with Clinical Nutritionists to assist her clients with peak performance. She believes that improvement in muscle recovery & overall health will help each client to elevate their quality of life. While working on her masters here, Cassandra plans on soaking in all of the many facets of our wonderful state (14ers, here we come!). When she is not training clients or exploring the Mountains, Cassandra loves to chill with a good book or watch her favorite basketball team…the Spurs, of course! Be sure to stop into our DTC location, Cassandra will let you take the sled for a spin! Contact Jess – We want to do something amazing with you!